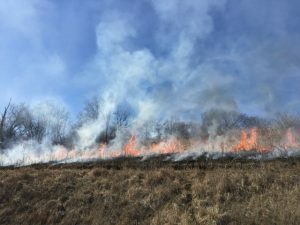 Properly controlled burns can have many benefits for agricultural land. However, if these burns are not managed safely, they can cause property damage, power outages, injury, and even death. Safe Electricity urges you to make safety a priority and shares tips on special considerations to be taken around power lines. First, make yourself aware of laws and regulations. Only those who are experienced with fire and burn paths should conduct one. Avoid burning near public roads or airports, as this can create a potentially dangerous visibility hazard. Alert those who potentially may be affected by the burn—including neighbors, the local fire department, and law enforcement. Depending on local regulations, you may also need to obtain a burn permit. Take special note of power poles and lines. Burning a power pole could cause a widespread power outage and be costly for the individual responsible for the fire. Cut down grass and weeds, and water the area near the poles as to not encourage fires to encroach. Be careful to keep water streams out of power lines. If a power pole catches on fire, call the fire department and alert your utility to handle the possible electrical dangers. Even if you think you can put out the fire yourself, alert the utility to the fact that it caught fire. The creosote, a preservative, on the inside could still be burning the pole from the inside out. In addition, if the pole catches on fire, it could create shock or electrocution hazards to those who may be nearby or spark fires in unintended directions from downed lines. Also, keep environmental factors, such as temperature, humidity, and wind direction and speed in mind. The wind speed in the area should be low and in a steady direction as to not let the fire get out of control. As environmental factors are subject to change, check forecasts and actual conditions before you begin the burn.